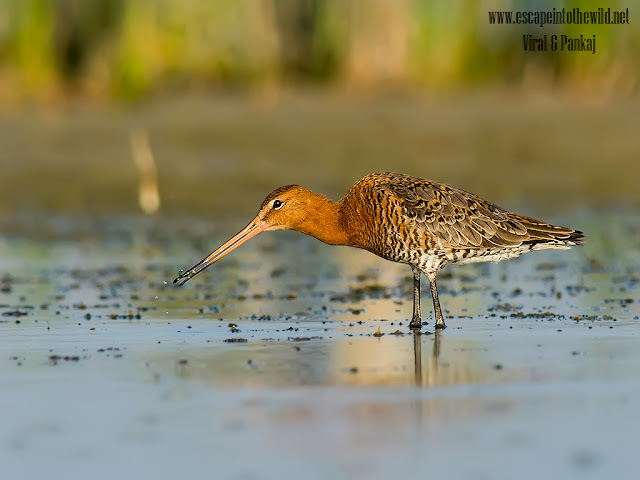 We are planning to visit the Kutch or Jamnagar for breeding plumage of waders from long time. Finally, Anand and I decided to try our luck at Nalsarovar. I reached Nalsarovar at 6 am while my friends Dr Anand Patel, Viren Desai and Hiren Joshi (all came for breeding plumage) were little late and came around 7 am to lake. With formal introduction with each other, we started our search for breeding plumage. All the birds in lake look like they are in breeding plumage. Their plumage is different from usual. When we enter into the lake, we saw the Pheasant-tailed Jacana and then we saw this beauty. It is in its full breeding plumage and foraging in shallow water. More about them, you can find on http://www.escapeintothewild.net/2016/07/black-tailed-godwit.html .